NoMa Social located in the Radisson New Rochelle in New Rochelle, New York is a stylishly cool and contemporary restaurant and lounge where Executive Chef Bill Rosenberg focuses on Mediterranean cuisine. 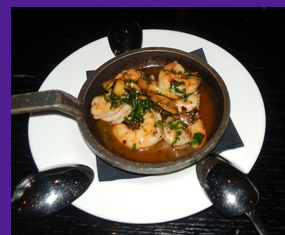 The menu features a diverse selection of tapas as well as large plates, and cocktail fans will appreciate the interesting cocktails. 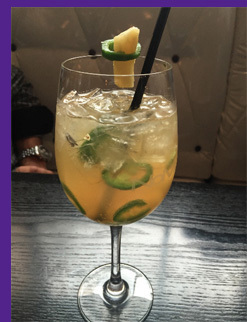 Located one-half mile from the New Rochelle Train Station, the restaurant is a mere 35-minute train ride on Metro North from Grand Central in New York City making it perfect to meet friends for lunch, tapas and cocktails, or dinner in the evening. We went to NoMa Social, which takes its name from its location "North of Manhattan," in early November 2015 for tapas and cocktails and loved the small plate concept where you can taste a variety of the interesting items on the menu. 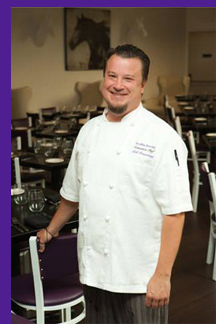 A graduate of the prestigious cooking school, The Culinary Institute of America in Hyde Park, New York, Executive Chef Bill Rosenberg brings his classic culinary training and his artistic vision to each of the tapas as well as the larger portions he creates for the menu. 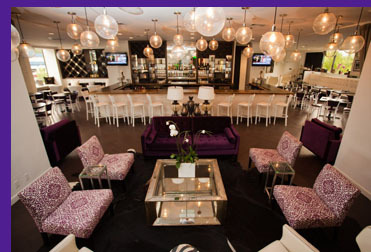 The ambience is contemporary cool and chic, with a predominant color scheme of white, black, and purple throughout the restaurant and lounge, with white tufted leather banquettes accenting black tables dressed with dark linens and votive candles, flanked by white and purple chairs. Cocktails play an important part in the NoMa Social philosophy to food and drink, and the cocktail menu features interesting, playful, and well-crafted cocktails, as well as sangria, wine, beer, and other spirits and beverages to pair with the food. We began our evening with two of the cocktails on their signature cocktail menu, Muddlin' Matt's Minty Makers a delectable blend of Maker's Mark Bourbon, elderflower liqueur, fresh oranges, fresh lemon juice, and bitters, and the Feisty Spicy, made with 1800 Tequila, Grand Marnier, lime juice, pineapple juice, simple syrup, fresh jalapenos, and garnished with a wedge of pineapple, both of which were well-crafted, tasty, and fresh tasting. For our first tapas, we had the Butternut Squash Soup with fresh cranberries served in a demi-tasse cup and paired with a gingersnap cookie, which provided a spicy finish to the creamy autumn soup and provided a playful insight into Chef Bill Rosenberg's vision. We loved the contrast of savory and sweet and the crunchy texture to offset the creaminess of the soup. Our next tapas was a Wild Mushroom Tosta, which was a round of toasted bread topped with herb goat cheese, mushrooms, and drizzled with balsamic attractively presented in deep white bowl. 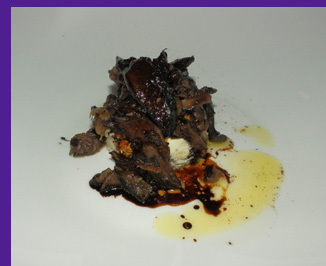 Earthy mushrooms paired with creamy goat cheese enhanced with balsamic was lovely. 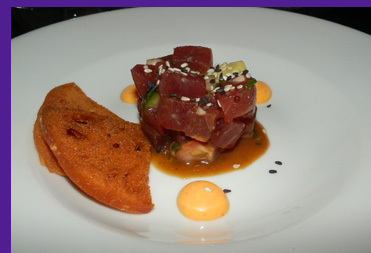 Tuna Tartare followed, which was large cut tuna laced with crushed avocado, diced cucumber, wasabi vinaigrette and dragon aioli that had nice spice notes to complement the tuna. We continued with Shrimp with toasted garlic, Marsala, chili flakes and herbs presented in a small cast iron skillet, and Ham and Cheese Croquetas with manchego cheese and aioli, which were crispy golden balls that yielded to creamy interiors and provided a nice contrast in taste and texture. 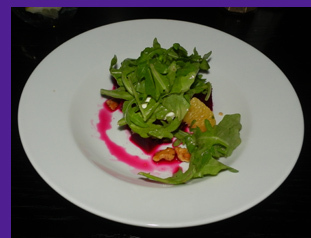 We finished our tapas with a selection in the "Market Greens" section of the menu, Beets roasted and marinated with baby arugula, orange, walnuts, and sherry vinaigrette. 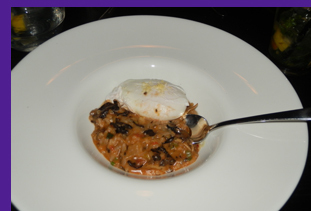 For our last savory taste, we had the Mushroom Risotto, from the "Not To Share" section of the menu, which was rich, hearty, and topped with a fried egg. 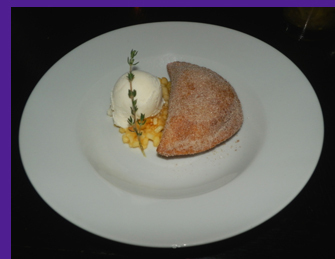 For dessert we had the warm sugared apple empanada served with a scoop of vanilla ice cream on a bed of tiny diced pineapple which was a lovely finish to our tapas experience at NoMa Social. NoMa Social is open daily for Lunch from 11:00 am until 4:30 pm, and Dinner from 4:30 pm until 9:00 pm on Sunday, Monday through Thursday from 4:30 pm - 10:00 pm, and Friday and Saturday from 4:30 pm until 11:00 pm. NoMa Social has Happy Hour Monday through Friday from 4:00 pm until 8:00 pm, with four different cocktails, beer, and tapas, for $4.00 each. The bar also offers a late night snack menu until 2:00 am on Fridays and Saturdays. There is a band on Friday and Saturday evenings from 9:00 until 11:00 pm and a DJ from 11:00 pm until close. Located one-half mile from the New Rochelle Train Station, the restaurant is a mere 35-minute train ride on Metro North making it easily accessible. Read the Chefs' Recipes section where Chef Bill Rosenberg graciously shares a few of his culinary and cocktail recipes: NoMa Pâté de Campagne, Exotic Mushroom Risotto, Smores, and Feisty Spicy. Bon Appétit! © December 2015. Luxury Experience. www.LuxuryExperience.com. All rights reserved.